A TIMELY tribute marked the 152nd anniversary of the birth of HG Wells on Friday. 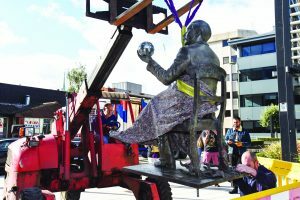 The seven-foot bronze statue of the internationally renowned author was moved from its temporary home in the garden of The Lightbox to its permanent setting outside Victoria Gate. Having put Woking on the map in the late 19th century by choosing Horsell Common as the location for the alien invasion in science fiction novel The War of the Worlds, it’s fitting his new site looks towards the town’s Martian sculpture.